I have two wonderful Marks & Spencer scarves to give away on the blog this week...something told me you're all big fans of a nice scarf! 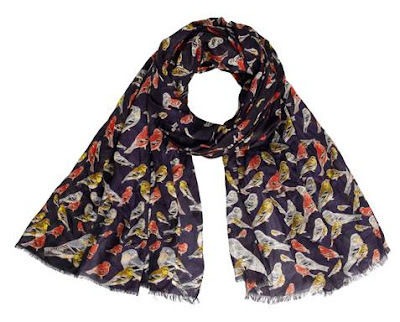 This is a gorgeous lightweight bird print scarf - you can read more about it (or buy if you can't wait to win it!) on this link. Perfect for wearing with the gorgeous autumn colours that are in all the shops at the moment. To win, all you have to do is leave a comment below telling me what one item from the fab new M&S TV Advert you would chose as your AW12 must-have. I'll draw a winner at random from the comments on Saturday next, 6th October at 9pm. Winners will be named on the blog and on the Facebook page on Sunday 7th October. Winners have 7 days to contact me on schoolgatestyle@yahoo.co.uk with their postal address. Another winner will be drawn if address details not received. Thank you to M&S & ASG Ireland for sponsoring this post! Not a proper entry ......but what I like best are the models. A mix of shapes and ages......why don't more retailers show their clothes on real women and show them looking beautiful? I love the Autograph Peak Lapel Coat with Wool, pale pink and gorgeous !! Love the cream lace overlay blouse - would look good dressed down with jeans for a drink after work or with smart trousers for somewhere more upmarket! I like the Limited Collection Jacquard Cropped Trousers - but probably not on my thighs - if I have very slim legs! Shawl collar contrast trim longline jacket: dress up or down, perfect! I love the stiletto Court shoes in caramel. A fantastic, go-with-anything wardrobe staple at a great price. And that scarf is stunning! Love the knitted mohair jumper, so soft and cuddly, although it may become a see it everywhere item, so I'm opting for the tuck stitch chunky knit. Again, warm and cosy for those cold, cold days. M&S have some lovely items this season, I could do some serious damage so I'm not going to look too closely....just yet! I loved the Per Una big check coat when I saw it. But I wasn't allowed any more coats - daughters have me on a coat diet - they say I have a problem - and you can only wear one at a time I suppose!!! I would take the sequined top the older model has on, one of the bags, the music, and all of the great attitudes the models have. We don't have commercials like this here. WOW! It was really fun to watch. Firstly I love the diversity of the models. It gives a real perspective of how the clothes look on real women compared to waif like models:)) I LOVE the green military jacket as classic winter wear. I imagine you could really dress it up or down too. Another favourite is the gold sequence top. Have to add some bling as the festive season approaches! What a great idea, to share our new season m&s must-haves with each other! Mine is the orange (for want of a more fashiony descriptive word!) trilby hat. Have been suffering from a lot of bad hair days of late and the hat looks stylish, eye catching and like it could top off any outfit fabulously (whislt distracting from bad hair!). It's the 3/4 Sleeve Leopard Print Burnout Top in Pink Mix for me! It would look great with plum coloured skinny jeans. The fashion futuristic dress had already caught my eye in the shops - I love the 80s influenced graphic print. I'd wear it with black opaques and patent wedges - fab! It's a great advert, clothes look so different depending on the body shape. I think the piece which is most me is the military coat. I love the abstract print dress but not sure I'd be brave enough to wear it! The black leather hobo bag would be my A/W must-have! I absolutely love love love the Autograph pink wool coat!!!! I love the Green Military Coat. I looks perfect for Autumn/ Winter and think it would suit a wide range of age groups and sizes. Love the first electric blue dress in the advert. Dress up, dress down. Perfect. I really love the Per Una Open Neck Collar Military Jacket - will look great with a black polo neck & dark jeans. I love the fur coat, it looks just the thing to keep me warm during the winter. I think I want all the shoes, all of them . Greedy , moi.....oh yes. it is good to see M&S getting back on trend, I stopped looking for a few years, but recently purchased their print jeggings which are fab,with regards to their current ad I keep looking at the amazing older lady and would love to have the glittery top perfect for Christmas, so yes I am back shopping in M&S !!!!! Loads! The sequinned top, the redish-pink trousers, the purple and cream silk dress (was eyeing this in Sprucefiled). I would choose the abstract print skirt. I love the glittery top with the little peter pan collar. Lovely for a night out - but why save glitter for evenings only! I love the jacket with the fur lining and collar - http://tinyurl.com/8jfn74p. It looks cosy but practical. Ooh what to choose....I really like the Per Una Lace Top with camisole as it is simple yet elegant top that be for both daytime or evening! Lots of lovely things, but definitely have to like the limited edition collection stud embellished asymmetric blouse. The gold sequinned top all the way! Electric blues dress for me - a fine way to jazz up the winter blues! I love the military coat - would be great with jeans and dresses. Military jacket for me. My old faithful coat is dying and I need a new classic to replace it. A bit unspecific but all the high heeled shoes. It is the one item which makes me feel glamorous for a night out or a wedding and less 'Mumsy'! I loved all in the ad! But the electric blues dress stands out for me. I love the green military coat. M&S fab for scarves at minute. I picked up the fab limited collection cosmic scarf the other day. Looks much better IRL than the pic online. So hard to pick one thing - love the sequins, love the leopard shoes, but it's got to be the khaki Military coat! Definitely the abstract Print dress. Looks great for work or could be dressed up. Also thd ruching looks like it will hide mummy tummy! Love the Indigo Collection Cotton Rich Faux Fur Trim Parka which appears to be out of stock so at least I won't be (or rather can be) tempted to buy - ha ha!! Another vote for the military coat. The military coat - loving all things military at the moment! I think the tuxedo jacket would be a great staple for any wardrobe. The front zip tassel bowler bag in the plum colour. V.nice. Or the glittery tunic top! Actually there's quite a lot I'd like. But the bag the most! the cream lace blouse is just beautiful.